To hear how to pronounce the letter sounds in this book, click on the pronunciation guide below then click on the arrows to hear the sounds. For links to websites with advice for parents and activities for children getting ready to read, click on a topic below. 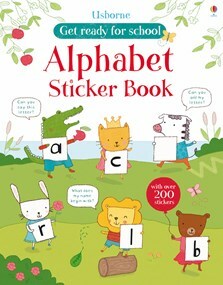 A delightful alphabet sticker book, ideal for helping little children learn their letters before they start school. With over 200 stickers, young children will enjoy helping the friendly animals in this book find the right stickers to complete the activities. This fun sticker book provides lots of practice with letter recognition, essential knowledge for starting school.